The best way to honor this dealership and Joseph Daou, is to share a great experience I had with Joseph Daou the GM of Volvo Surrey. Here is an example of personal service I received last December: During the month of December while I was going through chemotherapy, & my car didnt start. Oh my.. I was so upset. as I had chemo the following Friday at 7am! Already, I was worrying about the flurries that were to fall, but I thought, its good to have a "Volvo", well be fine. But, now the car was dead. I called the dealer in N. Van, as we had the car serviced prior to my chemo so we would have a "smooth" ride, and no worries during this difficult time. They (Clint) reacted very quickly, and in 15 min there was a tow truck at our door. I then realized the car would go in the opposite direction to Volvo Surrey, who is actually closer. My service guy isnt there. Regardless, we are car-less, as we just took my husband’s truck off the road for the winter. I then found out that the GM of Surrey is "our guy, Joseph Daou", that we have purchased 3 previous Volvos from. The tow truck driver just wanted to "boost" the car, and I was concerned, as was Volvo, that it was just not the battery. So, Joseph jumped into gear when I called. I was so upset, and explained to him the need of our vehicle. He was truly amazing, and brought customer service to the next level, and humanity also. He had a brand new car waiting for my husband when he arrived with the tow truck. Joseph arranged for someone to bring back our car when it was ready, and take back their Volvo. Our car was returned after some major checking, and of course is perfect now. We change our car every three years, and I think Joseph will be top of the list. Its not about the car, its how they reacted. If you expect a high level of service from your dealer, these folks should be on top of the list! We will be purchasing our next Volvo in July! It’s a good thing my family drives a Volvo! These words never rang more true than recently when my daughter was in a serious car accident. While trying to turn left at an intersection another car ran the light and hit her straight on. The front end of our Volvo was punched in and completely destroyed, but the rest of the car, the passenger compartment was entirely normal… still in alignment, no damage at all, the doors even closed normally. The other car that hit her was a total right off, completely damaged from front to back; the driver went to the hospital in an ambulance. My daughter and her friend walked away. Good thing my family drives a Volvo. ICBC wrote the car off and as a present from my daughter I got to purchase a new car. Of course I was going to buy another Volvo, so I headed over to Surrey Volvo to see what was available. Given the sudden expense and not getting much from ICBC, I was looking for a used vehicle. I met Peter Sakamoto and right off was very comfortable with is approach. He was casual, polite and quickly understood my needs. After several visits looking for the ideal car (including visiting the Audi and BMW dealers) we settled on the Volvo S60. Peter was able to find a used 2014 Volvo that met all our requirements including our price. I highly recommend Surrey Volvo and Peter Sakamoto and believe you will find a good car and a good deal too! For a long time, I have hated stealerships, based off many personal experiences and experiences of friends. I now do a lot of the car work myself and have friends and a reliable cheap mechanic to take on heavier projects. I required a proper scan for codes and as I do not have a vida/dice, I drove over to Volvo Surrey which it is close to my work. 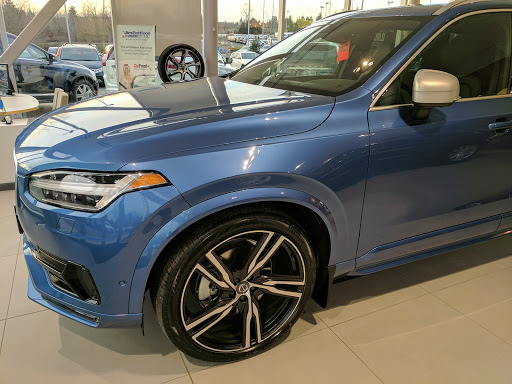 To my surprise, they charged me way less than I expected for a scan (having been used to other unmentioned Volvo dealerships who have gouged me for this process - up to 3 times as much) and were very knowledgeable. I asked how much an oil change was and again was very pleasantly surprised at the dealership cost (incl inspection, wash, etc) of 60-65 for dino oil - when I change the oil myself, the oil and filters alone cost around $40. I just returned from having my oil changed and they went above and beyond in checking things that I requested and did not charge me for. The service adviser, Steve, was excellent, the tech Chris knew what he was talking about and gave me sound advice to some issues I was having. Zero upselling and reasonable quotes for work that needed to be done. Bonus is the waiting area is great, with a desk to work at and wifi; sounds like they do not charge for use of service vehicles, unlike other Volvo dealerships. They have renewed my faith in dealerships and I will be returning in the future! If you like CONDESCENDING, INDIFFERENT, ARROGANT and INSINCERE service, you will Love this place! 3 weeks into an ICBC theft claim, my Volvo left outside the entire time, I discovered that the interior had been torched and all 4 doors were unlocked!!! It’s simple to access the service area practically unnoticed which I did,last Tuesday, going to check on the progress of my Volvo. This dealership is situated very close to the street at the start of the auto-mall with no barrier of any kind deterring the public’s access to the service bays area other than a 2 foot hedge with numerous gaps which the public obviously uses. I approached the service desk after seeing the interiors burnt condition asking what happened to my Volvo explaining the fire. I was told "not true, impossible" and lo & behold the all important manager graced me with his presence stating "we have cameras every where" my only comment to that was "try checking them then, maybe turn them on" there has been a fire lit inside my Volvo"! He came back with me (my suggestion) turned white with shock observing the interiors burnt condition. There was no apology actually not one word spoken to me period.I left saying" I needed to make a report to the RCMP". 5 days later and not one word or contact of any kind from the Volvo dealership. Ill keep waiting and keep you posted as the events unfold!